PRI-D – a capability confirmed in independently conducted ASTM D2274 Accelerated Stability Tests. 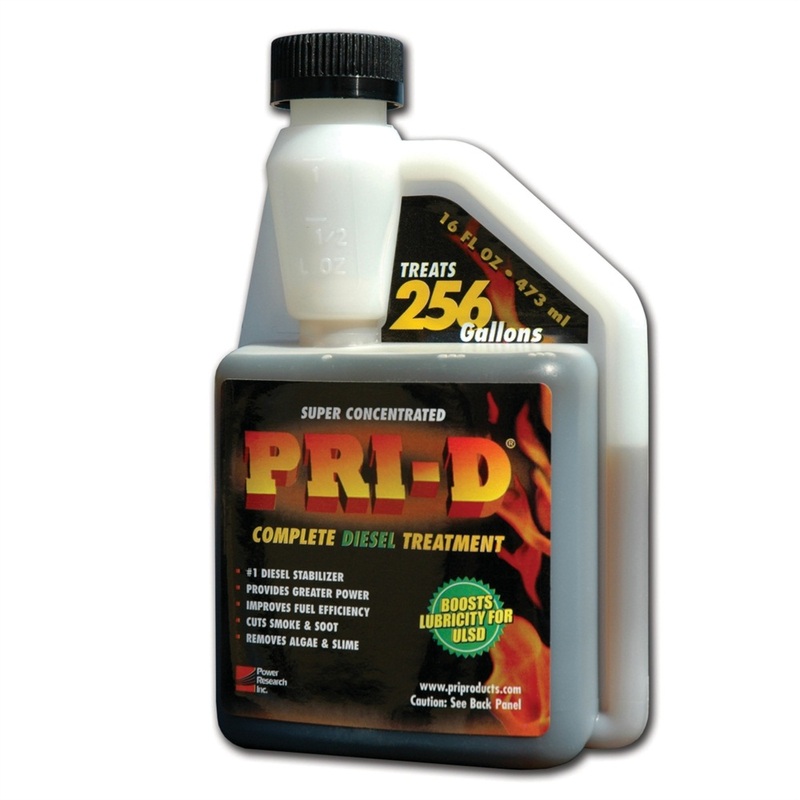 Optimum Performance- PRI-D maintains peak ignition quality. With the improved combustion of PRI-D treated fuel, you will realize increased power from your engine. PRI-D is also extremely effective at reducing harmful emissions. Reduced Maintenance Costs – PRI-D is a highly effective preventative maintenance tool. PRI-D’s proprietary, refinery-grade chemistry is unsurpassed at preventing carbon deposits and fuel system fouling. Your engine will remain cleaner and last longer. In addition, the tank slime and sludge that diesel fuel users commonly encounter is eliminated, along with frequent and costly fuel filter changes. Super Concentrated–PRI-D is super concentrated, treating fuel at a 1:2,000 ratio. This means PRI-D is extremely cost effective to use. Get the most out of your diesel fuel for only pennies a gallon. Safe To Use – PRI-D’s enhanced thermal stability chemistry works within the fuel instead of altering it, which means the product is completely safe to use. PRI-D contains no potentially damaging cetane improvement additives or harsh solvent chemistry. No fuel specifications are changed, therefore PRI-D meets all major engine manufacturer fuel specifications – warranties are not voided! Use PRI-D today to get the most out of your diesel fuel and your engine. PRI-D Diesel treatment 16oz Treats 256 gallons of gas. $21.95 each. PRI-D Diesel treatment 32oz Treats 512 gallons of gas. PRI-D Diesel treatment 32oz Case of 12. $390.00.